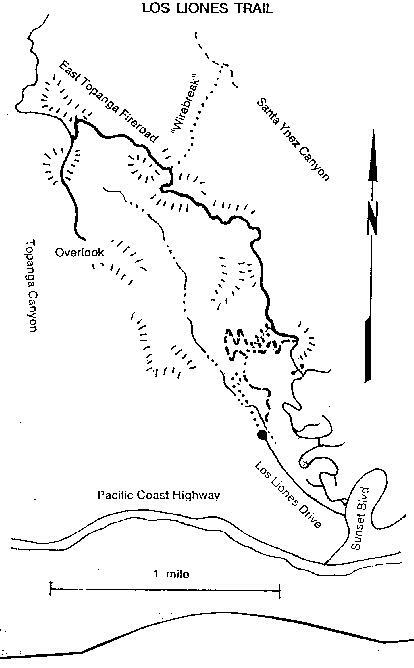 Two trails into the back country can be selected, one on the east of the intermittent stream, the other on the west. After many switchbacks through chaparral a temporary easement is welcomed before entering a somewhat leveled area. The trail makes many switchbacks through chaparral and temporarily levels out on a mesa after gaining 300 feet. After this brief respite we go into a bigpod ceanothus forest and gain another 400 feet as the trail makes countless switchbacks up the steep hillside. Abruptly, the East Topanga Fireroad nears and we turn left and follow it uphill. The road continues uphill until easing up in about two-thirds of a mile and a 500-foot gain. About 20 minutes later we look for a trail that follows the top of a ridge heading south. One half mile along the ridge brings us to the 'Overlook,' an area with a great view of the ocean and the seacoast. Palos Verdes Penninsula and Catalina Island are visible on clear days. Here's the new trail: "Within 100 feet of the fence turn right and cross the canyon. The trail angles left as it starts a gentle climb along the west-facing slope of the ridge. Ten minutes later the new trail temporarily merges with the old trail. After a few hundred feet it leaves the old trail to continue north. Gaining altitude at a moderate rate, the trail makes a few switchbacks as it heads north on the west-facing slope." The 1973 Trippet fire burned the slope south of the Overlook. For a few years a passable route went down the south ridge, but the chaparral has recovered so that the route is not in use. Return the way we came but take the time to look west into Topanga Canyon and the 1300-foot drop to the stream. One-half mile along East Topanga Fireroad we can look left down the "Wirebreak" and see Santa Ynez Canyon. This hike has some steep sections of trail that give most of us a good workout--but I have seen people run it. Upon arriving back at the trailhead, take time to notice the paintings that represent the local wild life.